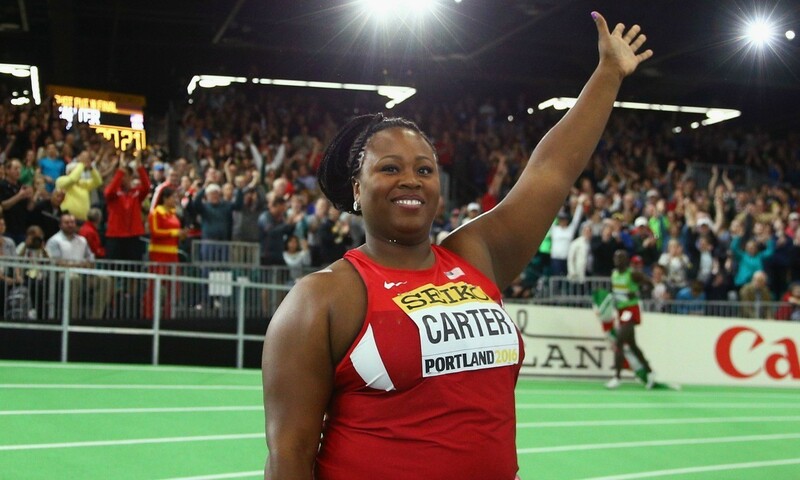 Michelle Carter achieved a meet record of 19.59m to win a top shot put competition on the seventh day of competition at the US Championships. Behind her, Raven Saunders threw 19.24m and Felisha Johnson 19.23m. Eight women threw further than 18 meters in total, with Tia Brooks ending up fourth and defending champion Jill Camarena-Williams fifth. Chase Ealey ignored the wet conditions to join the 60-foot club with an 18.46m/60-6.75 in seventh. Emma Coburn won the steeplechase in a meet record 9:17.48. Courtney Frerichs was second with 9:20.92 and third was Colleen Quigley with 9:21.29. Going into Thursday’s women’s triple jump final, only two athletes held the standard to compete in Rio: American record-holder Keturah Orji and Andrea Geubelle. Beijing 2015 competitor Christina Epps rounded out the trio for the Games when she leaped a lifetime best 14.17m in the fifth round to place second. Orji won with 14.32m and in third was Geubelle with 13.95m. Brianna Rollins led the first round of the 100m hurdles with 12.56 which is fastest first round ever at the trials. In another race, Kenni Harrison clocked 12.57. A total of 15 athletes went sub-13 seconds, seven of those dipping under 12.80. In a field filled with Olympians, the two big wows in the 200m heats came from high schoolers Noah Lyles and Michael Norman in 20.04w and 20.06w. Also Justin Gatlin, Ameer Webb and LaShawn Merritt easily qualified. The second 5000m heat was the faster of the two prelim rounds and Olympic trials 10,000m champion Molly Huddle easily won in 15:26.33. World champion and American record-holder Christian Taylor hit clear qualification in the triple jump with 16.87m, while 2008 Olympic trials winner Kara Winger led the qualifying round in the javelin with 61.42m. Dalilah Muhammad led qualifiers in the opening round of the 400m hurdles with a 55.33 while high school sensation Sydney McLaughlin followed with a 55.46 heat win of her own. On the men’s side, it was a sub-50 battle as six men went below the 50-second barrier to qualify out of the first round with all the favourites. Mason Finley led the field with 66.72 in discus qualification. Saving their best for last, the trio of Amber Campbell, Gwen Berry and DeAnna Price utilised their last two rounds of throws to qualify for Team USA in the women’s hammer throw on Wednesday at Hayward Field. Campbell made her third Olympic team, while Berry and Price recorded season and personal bests, respectively, en route to becoming first-time Olympians. Campbell got 74.03m, a trials record, with Berry 73.09m (second best 72.04m) and Price also 73.09m. Fourth was US record-holder Amanda Bingson with 70.30m. Rudy Winkler, the 2016 NCAA runner-up, surprised the field with a fourth round 76.76m to move from fourth to first place in the men’s competition. Kibwe Johnson, the defending Olympic trials champion who placed ninth at the London Olympics, finished second with a toss of 75.11m. Claiming the third position was Conor McCullough with 74.16m. Johnson, meanwhile, has the top American mark in the Olympic Games qualifying window with 76.95m. This day at the US trials was only for hammer competitions. Sprint star Usain Bolt will be among the names listed by the Jamaica Olympic Association (JOA) on Monday when it confirms the athletes who have qualified to represent Jamaica at next month’s Olympic Games, informs the Jamaica Gleaner. He will be one of four names to be entered in both the 100m and 200m. At the end three can compete. The third-place finisher in events at the national senior championships is essentially a provisional qualifier, with the organisation reserving the authority to replace that athlete. Leading Jamaican women’s 400m hurdler Janieve Russell and world 200m silver-medal winner Elaine Thompson have also been selected by the committee as one of four submissions for their respective events. World 200m finalist Zharnel Hughes has been struggling with a knee injury this summer. He finished fourth at the UK Championships and didn’t progress through his heat at the European Championships. “I need to rest up now and get myself sorted for next year,” he said. The 2016 Herculis meeting will feature a top men’s high jump competition, a French duel in the men’s 200m and a selection of world champions and Olympics medallists in other field events. In the high jump Mutaz Essa Barshim takes on Derek Drouin, plus Gianmarco Tamberi, Syrian Majed Aldin Ghazal and Bohdan Bondarenko. In the 200m Jimmy Vicaut will clash with Christophe Lemaitre. Other top stars will be Katharina Molitor in the javelin, Yarisley Silva in the pole vault and Caterine Ibarguen in the triple jump, all three Beijing world champions.